Whatever your soil type, mismanagement can rapidly deplete the soil fertility and create an unproductive environment for any crop to grown in. Over the millennia, the mineral particles that created soil will have experienced different weather patterns, therefore the proportions of sand, silt and clay will vary widely. The fertility of a soil will be dictated by the combination of mineral variability and the inherent variability in the main soil components. Mineral particles derived from rocks by weathering. Soil air – both oxygen and carbon dioxide which help microbes to survive. Soil water – containing dissolved nutrients. Living bacteria that help with plant decomposition. Organic matter – broken down into humus for plant utilisation. Not many world soils can be described as having a high level of natural fertility. Most are at best reasonably fertile, or poor. High fertility soils have largely been formed by ancient alluvial deposits of river mud and organic material. The soil texture refers to the relative proportions of sand, silt and clay that it contains. 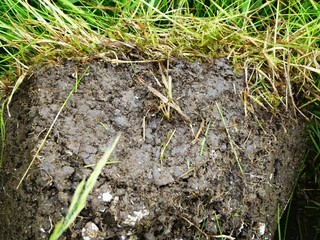 This is then defined as a soil type i.e. 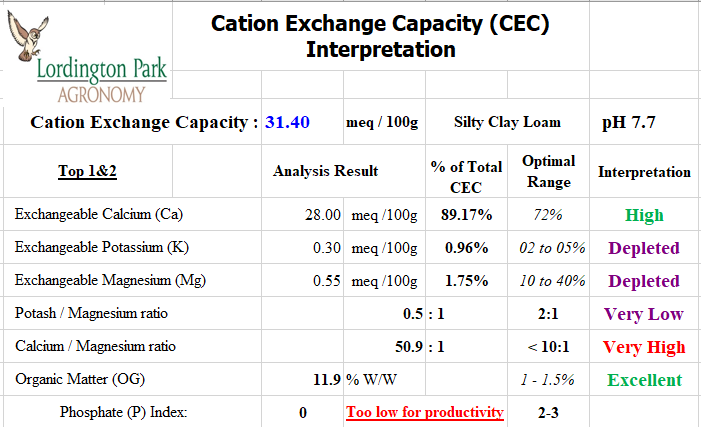 Silty Clay Loam. Loam is a mixture of sand and silt, with a low proportion of clay. Because of their miniscule size (<0.002mm) clay soils have the largest surface area, followed by silt (0.002-0.5mm), and then sand (0.05-2mm). Clay and silt have a negative charge on their surface, while sand is inert. Because of their huge collective surface area, clay particles generate a strong negative charge in the soil. Most plant nutrients are cations and have a positive charge. This positive charge then binds them to the negative charge on the clay and silt particles in the soil, retaining them in the soil colloid for the plant to utilise. Organic matter also has a predominately negative charge, and therefore helps to retain nutrients in the soil for plant utilisation. Not only does the organic matter provide a food source for the worms and other soil organisms, but as the organic matter decomposes it slowly releases nitrogen and phosphate for the plants to use. The pH of a soil will further affect which nutrients can be exchanged, as the pH alters the electrochemical process in the soil. A pH outside of the neutral range 0f 6.5 – 7.0 will increase the electrical charge in the soil which effectively means that the nutrients are adsorbed (stuck on the outside of) the soil colloid. Once these soils variability is understood then a management strategy can be created that complements the soil type. Recently I was asked to generate a Sward Improvement Plan for newly acquired land near Aylesbury. The area historically has a high calcium content, and I was hoping that the land had not been purchased from an arable farmer! If the land had been ploughed by the farmer, then the valuable clay and silt content of the soil would have been sieved out [never to return] and lumps of calcium would have been brought to the surface. Few crops will grow sustainably in that. Once I saw the field it was obvious that it hadn’t been touched for years. Thankfully there were few Docks or Nettles to contend with, but plenty of Chamomile Daisies and the odd Cornflower to greet me. Mostly populated by unproductive Meadow Grass species, interspersed with Cocksfoot and Sheep’s fescue grasses. Once I started digging holes it was apparent just how fragile this soil environment was. A Silty Clay Loam consists of many tiny mineral particles. Reasonably dark – indicating a good level of organic matter. So, the soil had not been disturbed for decades, which is a good indicator of future productivity potential. Satisfying levels of worms in all samples too – worms are the soils natural garbage recycling experts. The analysis confirmed this potential with a CEC of 31.4meq / 100g. This is rare, and exceptional for a calcareous soil. The levels of Arbuscular Mycorrhizal Fungi must have built up over decades to colonise the soil and increase the nutrient exchange capacity to this level. This high level was replicated across the rest of the field. The organic matter level of 11.9 per cent also indicates that the natural cycle of growth and decay has been taking place for a very, very long time. In comparison the average arable UK soil will only have 2-3 per cent at best. A few nutritional problems to rectify, but a gentle management strategy with minimal intervention is the key to maintaining this amazing level of fertility. Further investigation of the field, while watching a Muntjac deer, produced some even more intriguing results. The bottom end of the field had a large population of Cocksfoot Dactylis glomerata. This must have been introduced by people with foresight in the distant past, as Cocksfoot’s deep root mass and natural ability to withstand drought meant that it was ideally suited for forage production on these soils. Because of its robust nature and consistent feed value Cocksfoot began to be sown widely in the UK from the early 1800s, I have always been a great advocate of Cocksfoot (much to the annoyance of the Ryegrass advocates!) as it withstands all the vagaries of the great British weather and plays a significant part in restructuring soil to the benefit of both nutrient exchange and nutrient retention. The deep root mass also creates an environment that encourages the retention of the humus that the worms and bacteria have created which consequently increases the productivity potential of other less robust plant species. In my experience a soil sample with such a good analysis of a CEC of 31.4meq / 100g was unusual, but a soil with a CEC of 40.1meq / 100g is exceptional! 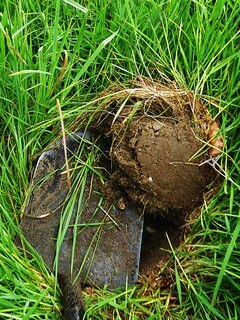 That was the analysis from the soil in the area with the Cocksfoot and serves to demonstrate just how much that this grass species contributes to sustainable grassland productivity. The soil around the Cocksfoot’s roots had less sand and more silt than the earlier sample, but that difference alone can’t account for the significant increase in CEC. To increase productivity for the new sward, the field will need an application of Magnesium and Phosphate to encourage the development of the new roots and increase photosynthetic activity. 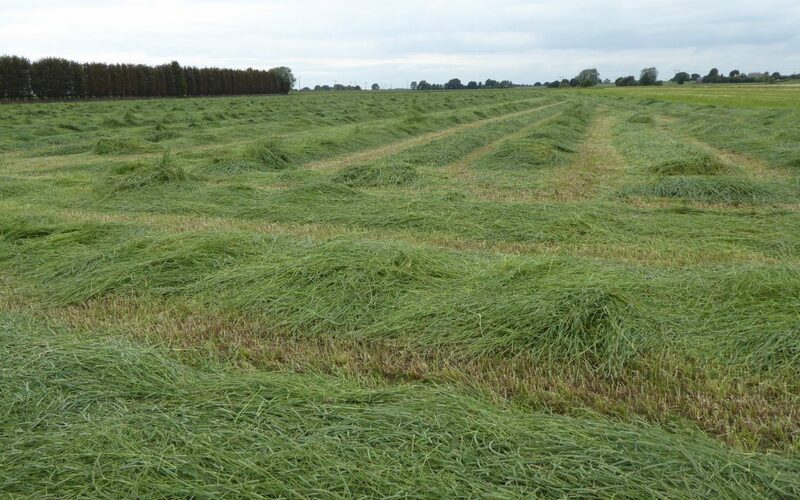 Magnesium also encourages Phosphate absorption, so both will encourage development in the new grass species. Both nutrients will be applied once the bespoke grass seed mixture has been slot-drilled this autumn. The Magnesium will also balance the Calcium / Magnesium ratio in the grass so that the horses will be eating nutritious grass instead of the current grass filled with lignin – similar to tree bark. Once established, the new grass should be able to access the Phosphate from the organic matter.